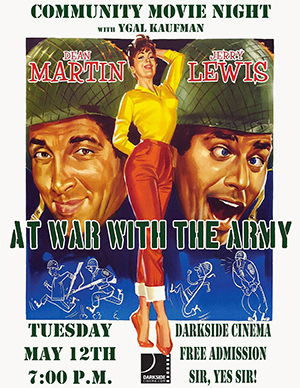 Directed by Hal Walker, starring Dean Martin and Jerry Lewis, At War with the Army is the 3rd of 17 film collaborations between the great singer and the great comedian. Based on a Broadway musical, it’s the zany story of Alvin Corwin (Lewis) an interminable klutz who belongs nowhere near our nations defenses. And of course Dean is the suave straight man that sets off Lewis’ wacky physical comedy so perfectly. We’ll see Hal Walker’s work again in June when we screen Road to Bali (1952) which also features a cameo from Martin & Lewis. The duo only lasted together for 10 years, but their body of work will last forever. Don’t miss this comedy gem on the big screen at the Darkside Cinema. Admission is free and the popcorn is hot. And of course, buckle up for some preposterous newsreels and other treats from 1950 to get you in the mood. It’s Community Movie Night with Ygal Kaufman, Corvallis’ smartest classiest best only free night at the movies! See you all there! The paragon of unsdteranding these issues is right here!